23 people tragically died due to a stampede in the railway station of Elphinstone Road. Exactly after a 5-month gap, the Army has swung open the gates to a fresh Foot over Bridge or FoB. 2 other Foot over Bridges at Ambivli station and Currey Road on Central Railway were constructed along with the aforementioned FoB. These were inaugurated in the presence of Piyush Goyal, Subhash Bhamre, and Devendra Fadnavis, the Railway Minister, Minister of State or Defense, and Chief Minister of Maharashtra, respectively. These bridges were constructed by the exceptional engineers from Army in 117 days, which is a record. Fadnavis and Goyal expressed their gratitude to the Army for their dedicated contribution and speedy completion of the FoBs. 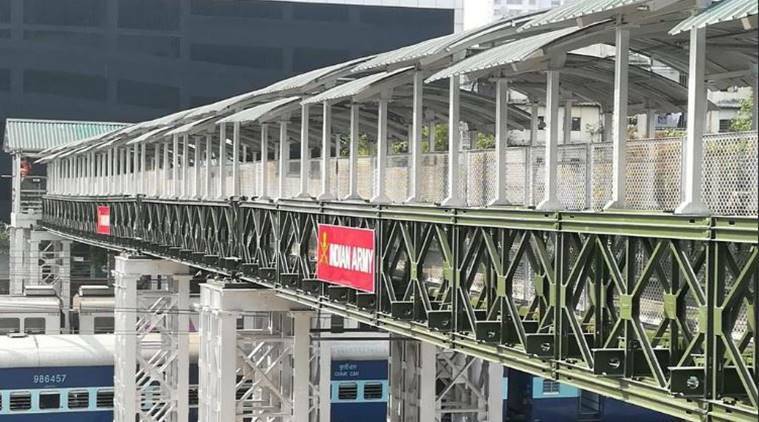 The new bridge on the Elphinstone Road is spread over the Western and Central Railway tracks, connecting the east side that has Parel station of Central Railway and the west side which is the Phoolwali lane in the outskirts of the Elphinstone Road station. It was a remarkable move to hand over the construction work of the FoB to the Army post the mishap of the stampede on the staircase. It occurred due to the narrow passage of the staircase and the rush during the morning hours. The newly constructed bridges at the stations of Elphinstone Road, Currey Road, and Ambivli are 70 meters 30 meters, and 20 meters long. The task of completing the 3 FoBs within a period of 4 months was accomplished with the help of the 250 people from the Bombay Engineering Group and Center that is located in Pune. It is also known as Bombay Sappers. Goyal and Fadnavis had also attended the event at the CSMT building located in south Mumbai where the government of Maharashtra handed over the documents of land for the projected high-speed railway terminal at the Bandra–Kurla Complex or BKC. This belongs to the Bullet train project foreseen by the Railway Ministry.